EDUARD ARRIVES AT THE TOP OF THE HEAP! Often derided as the least of the fighters with which the USAAF went to war, the airplane the RAF rejected and only the Russians loved, the Bell P-39 "Airacobra" has mostly gotten a bad rap for events beyond its control, all stemming from the completely-idiotic decision by the Air Force to remove the supercharger that originally equipped the prototype when it developed problems; this dropped the P-39s overall performance and crippled it at altitudes over 10,000 feet. when this was followed up by sending the airplane into combat with under-trained pilots against the pilots of the Imperial Japanese Navy - at the time perhaps the best pilots in the world man for man - and forcing it to fight at altitudes at which it could not perform... no wonder it got a bad reputation. On the other hand, the Russians - who used the airplane for combat below 10,000 feet where its performance wasn't crippled - couldn't get their hands on enough Airacobras; the airplane was flown by several of their leading aces, including second-ranked Alexsandr Pokryshkin, who scored the majority of his victories in Airacobras. In North Africa, where the airplane was used within its performance envelope, it won a respectable reputation as a low-level tactical aircraft. No less a judge of aeronautical horseflesh than chuck Yeager called the P-39 "my favorite for all-around flying so long as you didn't take it over ten thousand feet; other than that it handled beautifully." The P-39 prototype first flew April 6, 1939, where it climbed to 20,000 feet in five minutes, and demonstrated a top speed approaching 400 m.p.h. Its heavy armament of one 37mm cannon, two .50 cal. machine guns two .30 cal. machine guns was made possible by the radical design step of mounting the Allison engine on the aircraft's center of gravity, behind the pilot, powering the propeller through an extension shaft. This also allowed the airplane to become the first fighter with a tricycle landing gear, which made it easier to handle on the ground than the conventional taildraggers. Unfortunately, the Army Air Corps at the time was singularly unimaginative in deciding the use of the airplane. With an official national policy of isolationism, it was not expected that the United States would face an enemy with an effective fighter force, which meant that U.S. fighters would not need a high-altitude capability since they would be strafing invaders on the beach. Thus, both the P-39 and P-40 were crippled at birth by the removal of the supercharging systems each prototype was equipped with; the P-38 only escaped this fate because it was to be a bomber interceptor, and even the USAAC expected enemy bombers to come over at high altitude. The British Purchasing Commission ordered the airplane as the Airacobra I, based on the P-39D configuration which was the first version produced in any numbers for the Air Force. This airplane differed from the American version by the substitution of a Hispano 20mm cannon for the Oldsmobile 37mm weapon that equipped the P-39D. By the time the Airacobras arrived in England in July 1941, air combat was regularly taking place at altitudes well over 10,000 feet; 601 Squadron found the airplane lacking in capability for ETO conditions, and the 212 of the remaining Airacobras were sent on to the Russians, who fell in love with them for their heavy armament and good handling. The remaining 179 aircraft on the British order were confiscated by the USAAF after Pearl Harbor and designated P-400 Airacobras. These airplanes were sent on to the Southwest Pacific, where they entered combat over New Guinea with the 35th and 8th Fighter Groups in March and April 1942, and later with the 67th Fighter Group at Guadalcanal. The P-400 was completely outclassed by the A6M2 Zero-sen by which it was opposed; coupling that with the fact the IJN opponents were among the best fighter pilots in the world made flying P-400s out of Twelve Mile 'Drome very difficult indeed. Edwards Park - later Curator of the Smithsonian Institution - was one of those pilots; his book "No, No, Nanette" provides an excellent account of these events. Eduard first made its name with World War I subject matter, the only other non-WW1 airplanes the company has released in 1/48 were the excellent Yak-3, Tempest, He-280, and X-1 kits. 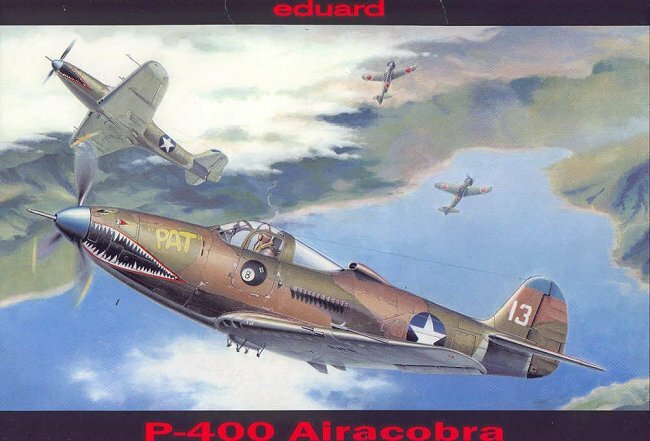 This P-400 - the first of a series that will include the P-39N, P-39Q and the post-war racers, all to be released over the coming year - puts the company in the same class as Tamiya and Hasegawa as regards production design and production quality. The kit comes on three sprues of khaki-colored plastic, with the separate cockpit doors and canopy in very clear plastic. Overall the moldings are crisp with engraved detail and no flash, with items such as gear doors nice and thin and landing gear very petite. 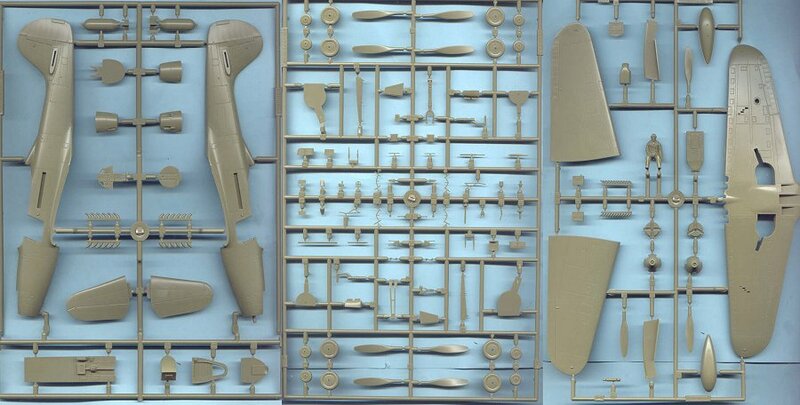 The differences for the various P-39 models - mostly in exhaust stacks and propeller blade shapes and number - are already here in the kit for the modeler who can't wait for the later releases. 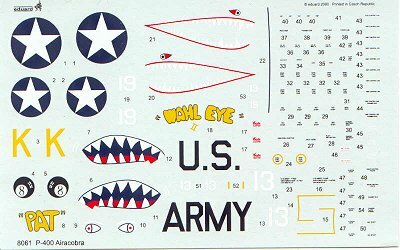 Decals are provided for two aircraft, "Pat/Wahleye" of the 39th Fighter Squadron, 35th Fighter Group - the airplane on the cover of the Squadron In Action book - and "K" a shark-faced P-400 of the 80th Fighter Squadron, 8th Fighter Group, both at Twelve Mile 'Drome in New Guinea in 1942. While a Profipack version should be released in November with the usual fret of photo-etch detail for the cockpit, etc., there is no reason for a modeler to wait for that; this kit as it exists here is as well-equipped as anything from Tamiya or Hasegawa right out of the box. The provision of a molded-for-the-space nose weight is a very nice touch indeed. A question many modelers will ask is, is it five times better than the Monogram P-39, since it is five times as pricey as the older kit? I have a Monogram kit in the kit pile, and have looked them over together. The Monogram kit is still a good model, especially considering it has been available now for 31 years. Overall, the Eduard kit is the more accurate of the two as regards such obvious items as wing shape and taper, with more petite molding of the landing gear and gear doors. Unless cost is the only item on which the decision of which kit to build is made, the Eduard kit easily overshadows the Monogram release. As for your reviewer, this kit is going to the top of the pile, and it's going to take some convincing for me not to make it as the P-39N "Air-A-Cutie," for which I have had the decals with all that naked female nose-art set aside for three years now. Editor's Note. The October 2000 Wings/Airpower issue is on the P-39 and should be quite helpful when putting together this kit. Thanks to Eduard for providing the review kit. If you would like your product reviewed fairly and quickly by a site that has over 1400 visits a day, please contact me or see other details in the Note to Contributors.